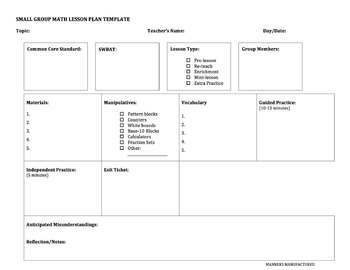 Here is a comprehensive small group lesson plan template that I personally could not live without. I made a few tweaks to it this year so that it could follow the Danielson model that my school district has recently adopted. The purpose of this template is to put you ahead of the game even before you call your small group. The plan is versatile enough to use it as a mini-lesson planner too. As always, my lesson plan templates are editable as a .docx file comes included. Lesson plans, like instruction, are never one size fits all. Please feel free to alter the plan to meet the needs of your students.